The text of this work needs to be migrated to Index:Baum - The Wonderful Wizard of Oz.djvu. The Wonderful Wizard of Oz is a children's novel written by L. Frank Baum and illustrated by W. W. Denslow. 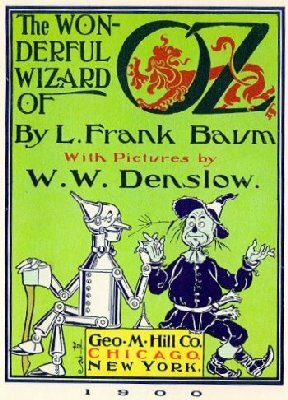 It was originally published by the George M. Hill Company in Chicago in 1900, and has since been reprinted countless times, sometimes under the name The Wizard of Oz. The story chronicles the adventures of a girl named Dorothy in the Land of Oz. It is one of the best-known stories in American popular culture and has been widely translated. Its initial success led to Baum's writing and having published thirteen more Oz books. This page was last edited on 13 August 2018, at 15:23.